A bible left behind at Whitney Houston's Newport Beach luxury rental is now on sale for $95,000. The owner says he found the bible in a box with clothes and CDs left by the trash at the home Whitney Houston rented from 2009-2011. Apparently the owner signed an NDA (non-disclosure agreement) and contacted Whitney's agent about the items and was told he could keep them. 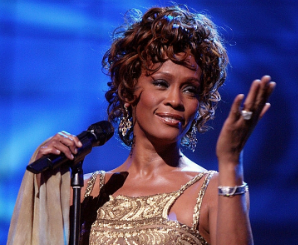 The bible has Whitney's handwriting of life events and dates like her marriage to Bobby Brown, her birthday, Bobbi Kristina's birthday, and more. Although the owner threw out the other items left behind at Whitney's old house, he kept the bible because he thought it was "interesting."